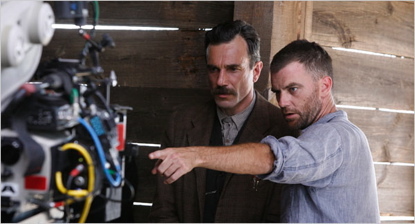 Paul Thomas Anderson’s latest offering, There Will Be Blood, is a departure from his large ensemble works Boogie Nights and Magnolia. This muscular, tragic film was penned for the screen by Mr. Anderson, based on Upton Sinclair’s novel Oil. Pic opens at the very end of the 1800’s when America was moving into the industrial age. Oil was the new gold and Daniel Plainview (Daniel Day-Lewis) saw an enormous opportunity. Mr. Day-Lewis is the face and voice of the entire film. One of our most talented actors working today, he delivers a tour de force performance. As Bill the Butcher in Gangs of New York, his spine was stiff and straight, towering over everyone in Paradise Square. Here his back is bent from years of hard labor in the wells, but he still seems to be the tallest. 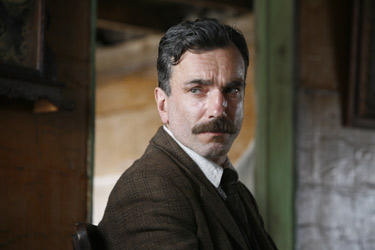 Like Bill the Butcher, it becomes obvious Daniel Plainview is an unstable and dangerous man. He is utterly and completely devoted to gaining enough wealth from oil to allow him to get away from everyone, forever. He does not speak of the past, invests in people only when it serves his agenda and carries a grudge the likes of which you’ve never seen. In a contemplative monologue he unleashes a wicked stream of consciousness, “I hate most people. There are times when I look at people and I see nothing worth liking. I want no one else to succeed.” You get the gist. The first 15 minutes of the film go by without any spoken dialog, which helps us focus on the work and considerable skill needed to successfully strike oil. Already well established, “I’m an oil man and you will agree,” Plainview meets a young man who tells him Standard Oil is buying up tracts of land in a small town in California. With considerable drilling experience under his belt, Plainview visits the area and talks the town folk into leasing him the land to prospect for oil. His careful and deliberate choice of words is at the level of a con artist taking a mark. One family in particular, The Sunday’s, are first to sign. Eli Sunday (Paul Dano) is the son and a man of God. He has a talent for giving revival-type sermons and expects Plainview to help finance his new church. He considers himself a worthy opponent to Daniel. Big mistake. Planview uses his 10 year old son H.W. (Dillon Freasier) to help lend credibility to his “family business” angle, and quickly signs all but one hold out. Early on in the project H.W. is severely injured in an accident and Daniel sends him to San Francisco for specialized help. Out of nowhere, a man claiming to be his brother Henry appears, to tell him their father is dead. He shares a note from their sister to prove his lineage. Daniel takes Henry under his roof, and to a business meeting with the Standard Oil executives who offer him $1 million for his wells. Daniel refuses, threatens the execs, and instead, cuts a deal with Union Oil to build a pipeline to carry his black crude straight to the Pacific Ocean. The story takes a dark turn as a murder is committed, and Daniel finds himself trapped by the actions of the lone land holdout. Plainview must consent to be saved by Eli in exchange for the land lease, something he finds very difficult to do in a scene that is excruciating to watch. H.W. returns to his father and strikes up a relationship with Mary Sunday, the youngest daughter, that leads to marriage. Liquids are the catalyst and cause of greed and desire for power. Everyone has their liquid of choice. Daniel’s is of course oil. He examines it as if it were an endangered species, smelling, tasting, burning it. He rubs it in Eli’s face in a fit of rage. Eli has his baptism water and takes his revenge on Daniel during the fake redemption sequence. The closing scene is a jaw-dropper. Daniel has made a fortune and built a mansion for himself including a bowling alley. He uses the main hall for a firing range. In the end he has it out with his son H.W. as well as Eli Sunday, who visits him to get his once promised donation. Film is masterful in technique. You are so completely engrossed in the lives of the people and the story that the 2 hour 30 minute plus running time goes by without a squirm. Shot predominately outside in a beautiful but barren landscape, Mr. Anderson authentically captures the sights and sounds of early 20th century America. But it’s the dialog that propels the drama. Everyone is polite in a matter-of-fact manner, trying hard to transform the wild west into civilization. Jonny Greenwood’s score is sometimes loud, frequently haunting and more often than not seems out of place for the early 1900’s. But it’s right at home in Plainview’s world. Highly recommended for the serious film goers who appreciate this craft being practiced at the highest levels.